Just Romantic Suspense: LUCK OF THE IRISH Giveaway! Congratulations to our grand prize winner, "Suzie B." and our runners-up, "Michelle N." and "Connie J." Thank you to everyone for participating! 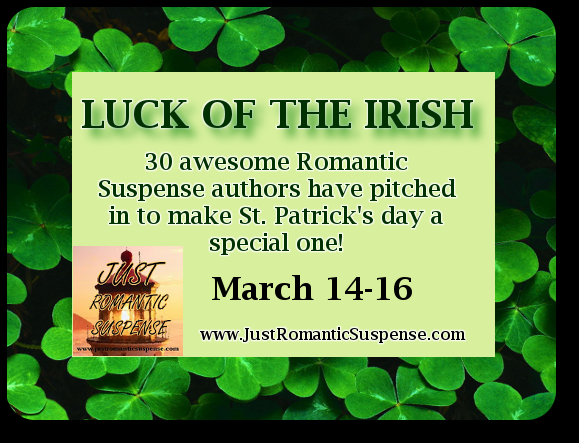 From March 14 -16 everyone has an opportunity to experience the LUCK OF THE IRISH on JUST ROMANTIC SUSPENSE! On March 16th, one grand prize winner will be able to select 10 titles of their choice from the Pot Of Gold. Giveaway ends 11:59pm EST March 16th. Please supply your email in the post. You may use spaces or full text for security. (ex. jsmith at gmail dot com) If you do not wish to supply your email, or have trouble posting, please email maureen@justromanticsuspense.com with a subject title of JRS LOTI GIVEAWAY to be entered. Please note the author's individual restrictions. I also have a super nerdy green videogame T-shirt that I love. My favorite green thing is grass. I live in Pennsylvania and we have had such a long winter I am so ready to see some green grass instead of snow lol. These books look very good. I wish I could win! After the long winter I'm ready to see anything green. I think my favorite is the first green leaves on the trees in the spring. In the spring, fresh Green grass that I can run through in my bare feet. Green trees - I love evergreens for year round color! My favorite green would be grass and trees. After looking at bare trees and snow since October, I am ready to see grass and full leaved trees as soon as nature will cooperate. If I had a lot of "green" I would have gone to a location this winter where there was grass and trees, perhaps palm trees. And I love my Peridot green ring too. I love avocados and asparagus. Of course after the winter we have had I am looking forward to the green trees.lol A wonderful giveaway. The emerald earrings from my grandma! Happy St. Patrick's!!! :) I love green... one of my fav green things is my shamrock chime. Nature's green . . . grass and trees! Thank you so much for the awesome giveaway! This Irish lass is doing a happy Irish stepdance around the room!! Green eyes are my favorite, but I also love jade. My favorite green is jade. I have this ratty old pair of green PJ bottoms, the most comfy thing EVEF. I am sure I will cry when they disintegrate. Thanks for the giveaway. Trishleroy 49 at gmail dot com. I have nothing green. Except a couple rooms in my house are green. Thanks for the giveaway! I have green eyes and get lots of compliments but my favorite green thing is a sweatshirt I bought as a souvenir in the Bahamas. My favorite green thing is a 4 leaf clover. I love looking for them when I see a patch of clovers. Thanks for the giveaway! Sorry but I messed up and ended up deleting my comment before I finished so let me try again and see if I survive. My favorite green thing is a large stuffed frog that sleeps on my bed. I have loved collecting frogs of all sorts since college. My pup, It's his birthday! I love bright green :) I have a fav t-shirt I wear all the time! Thanks for the fun giveaway! Broccoli is my favorite green thing. :) Yum! Oh, and peas. And my debit card. Ha! Thank you Kathi Daley for letting me know about this event. Any t-shirt from alma mater, Eastern Michigan University! Grass and leaves because we have had so much snow lately!!! Such a great giveaway! Green is the color for hope and luck !!! Green is my jade pendant necklace. It's green and jade is supposed to ward off bad luck. Oops, forgot to answer the question. My fave green item is the budding of leaves on the trees in spring and the sprouts of spring flowers coming up. Renewal, new life! Fun question, thanks for the giveaway. I have several favorite green things. A big comfy sweater I wear most weekends. Broccoli and spinach are favorite vegetables. As a May baby I gave several emerald pieces of jewelry, my favorite being a pendant my mom gave me. My favorite green item is a piece of furniture. My La-Z-Boy recliner has been in the family for at least 40 years. Originally covered in goldish-green fabric from the 70's, we've since reupholstered it in a shade similar to celadon. There's nothing much I enjoy more than relaxing in my green easy chair with a book and cup of coffee.